There is now a wonderful variety of Eucharistic prayers: the four that were introduced originally with the reform of the liturgy after Vatican II, two for Reconciliation and four for Various Needs. It pays to be as attentive as possible to these words since they contain rich teachings for our spiritual journey. All the prayers have the following common divisions but with different wording. The Eucharistic prayer (sometimes called the ‘anaphora’) is the central part of the Mass. It corresponds to the action of Jesus at the Last Supper, when ‘he gave thanks’ over the bread and wine. It would be wonderful for everyone to say the Eucharistic prayer together because it is the community’s prayer (note the ‘we’, ‘us’ and ‘our’). However, this is impractical so it is said by the priest representing the community. However, by means of a short dialogue, the congregation gives the priest permission to recite the Eucharistic prayer on their behalf. I have heard of a case where a priest had a very lethargic congregation and when he began this dialogue with ‘The Lord be with you’ and only got silence in reply, he said “I can’t go on – you are not giving me permission to continue.” This surprising comment woke the congregation up and the Mass proceeded. The dialogue encourages us to lift our hearts to the Lord and to give thanks to God. In fact, the very word ‘Eucharist’ means ‘thanksgiving’ and this is one of the key feelings expressed in the ritual: thanksgiving for all that God does for us, especially for the gift of Jesus his Son. We can add our own reasons for thanking God: for good health, financial security, freedom from terrorism, a democratic way of life, education, family life, good relationships and so on. It is truly right and just, our duty and our salvation, always and everywhere to give you thanks, Lord, holy Father . . . There are prefaces for every season, for Sundays, for weekdays, for the major feasts, for Mary, for martyrs, holy men and women, doctors of the Church and so on. As we eat his body which he gave for us, we grow in strength. As we drink his blood which he poured out for us, we are washed clean. The preface comes to an end praising God with all the angels and saints in heaven and introducing the ‘Holy, holy, holy’. This prayer is a joyous exclamation of praise of God and of Jesus who comes in his name and has echoes of Jesus’ triumphant entry into Jerusalem on Palm Sunday. It deserves to be sung. There is an invocation to the Holy Spirit to transform the bread and wine into the body and blood of Christ. For those interested in technical language this prayer is called the ‘epiclesis’. Activities that are outside the internal workings of the Trinity such as the creation of the world or sanctification of individuals, are attributed to the Holy Spirit, so the transformation of bread and wine into the body and blood of Christ is a work of the Holy Spirit. Eucharistic Prayer II calls on the Holy Spirit in this way. Make holy, therefore, these gifts, we pray, by sending down your Spirit upon them like the dewfall, so that they may become for us the Body and Blood of our Lord, Jesus Christ. As the priest says these words he holds his hands over the bread and wine to symbolise the coming of the Holy Spirit, the same gesture that is used for confirmation, holy orders and anointing of the sick. Note that it is not the gesture that brings about the change in the bread and wine. To attribute the change to the gesture would be to believe in magic. It is the power of the Holy Spirit that brings about the change. The gesture is the outward sign of the coming of the Holy Spirit. Note also that I’m not saying the change takes place at that moment. I dealt with this in Chapter 1. Rather it’s at this point that the liturgy recognises the action of the Holy Spirit throughout the Eucharistic prayer. We hear the narrative of the Last Supper when we celebrate Eucharist. The story forms part of every current Eucharistic Prayer in the Western Church and helps us to understand the Eucharist. As the name implies this was the final meal of many that Jesus had with his friends. Jesus knew it was his farewell meal, though the disciples were not aware of this. We can’t be certain that it was a Paschal meal as celebrated by Jewish people to commemorate their liberation from slavery in Egypt. The writers who describe the Last Supper, namely, Matthew, Mark, Luke and Paul certainly convey the atmosphere of a Paschal meal in their description of the event. On that basis we usually describe it as a Paschal meal, though the gospel of John suggests a different day in order that Jesus’ death on Good Friday coincides with the slaying of the lambs in preparation for the Paschal meal. The gospels make it clear that Jesus took a lot of care in preparing this meal because it became the launching pad for the most important spiritual action of the community that he would leave behind. Following his example, let us carefully prepare our hearts and minds well for this awesome mystery. Take this all of you and eat of it: for this is my body which will be given up for you. There are various levels of meaning in these precious words which have been the subject of much discussion and we need to look carefully at them before jumping to any hasty conclusions. When we receive the Eucharist, eating from the same table, preferably from the same ‘loaf’ (possible in a small group), this bonding becomes evident and is an important element in our Eucharistic practice. Following Jesus’ instruction the disciples each took a portion of the bread and consumed it. By this action Jesus showed that just as this bread was being taken, eaten, chewed up, so his body would be taken and disposed of. This happened the following day when his body was nailed to a cross and Jesus died. At the Last Supper Jesus prefigured this total gift of himself by identifying himself with the bread that was given out and eaten. Then the company would have eaten the rest of the meal with all its rich symbolism and teaching about the escape from slavery in Egypt, crossing the Red Sea and the 40 years in the desert before entering the promised land. The words ‘take . . . drink’ correspond to ‘take . . . eat’ that was said regarding the bread. Just as Jesus was giving his body to death on the cross, so he would allow his life blood to be ‘. . . poured out for you . . .’ Jesus was offering himself totally for us in the complete gift of himself, holding nothing back. Each of those at the table drank from the cup that Jesus offered them; this drinking from the cup symbolised in advance the pouring out of his blood. Eating the bread and drinking from the cup was a prophecy in action, a gesture much more powerful than any number of words of explanation or theology. The action of drinking from Jesus’ own cup was most unusual as each of those at a Paschal meal had his or her own cup and usually there was no sharing of a cup. Why did Jesus get each of those present to drink from his cup? Perhaps it was an invitation to them to share in his impending suffering. Why do I say this? Are you able to drink the cup that I drink, or be baptized with the baptism that I am baptized with? Abba, Father, for you all things are possible; remove this cup from me; yet not what I want but what you want. These two passages indicate that in this case the cup of wine was not a symbol of joy as it would usually be, but more like a cup of bitter medicine that must be taken. In the garden Jesus was disappointed that his friends could not stay awake and pray with him in his agony. Jesus’ human nature is well displayed here. He knew his suffering and death were rapidly approaching and his human nature shrank from the impending agony. At the meal he may have felt desperate for some company in his hour of distress, so the sharing of his own cup with the others may have been his way of encouraging them to share his suffering. But to his dismay the disciples were not up to the challenge. In the garden they slept, and when Jesus was arrested shortly after, all the disciples abandoned him. It hurts when you are snubbed by a friend; it’s agonizing when your spouse walks out on you, it’s frustrating when you are overlooked again for promotion. When these painful events occur you put them into the bitter chalice in your imagination and incorporate your personal pain with the pain that Jesus endured. Jesus’ suffering is the archetypal suffering of all humankind and includes all the suffering of every person on earth. It is for each of us to consciously insert into Jesus’ sufferings our own hurts each time we attend the Eucharist. A dry wine rather than a sweet wine would bring home more forcefully to our senses that taking the chalice is a sharing in the agony of Jesus. The reintroduction of the cup for the use of the laity is a wonderful blessing, an opportunity not be missed, a chance to be more in tune with the saving action of Jesus. Elsie gives a wonderful witness to the importance for her of taking the wine. By being alert to the significance of the chalice our spirituality is strengthened; we become more aware that Eucharistic spirituality can embrace the pains and hurts of life and can help us to integrate these into our lives in ways that make sense. 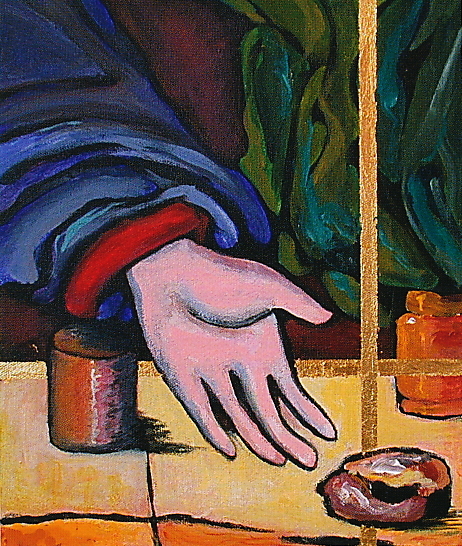 The Last Supper narrative is the story of Jesus giving himself in love. His self-offering is demonstrated clearly and vividly in the prophetic action of likening his offering of himself in love to bread being eaten and wine being drunk. Jesus goes on to say the pouring out of his blood seals a new covenant between the Father and us, a ‘new and everlasting covenant’. ‘Do this in memory of me’ is telling us that we are to repeat this prophetic action as the most effective way of remembering Jesus’ self-offering, his extraordinary love for us in being prepared to surrender his life ‘so that sins may be forgiven’. Eucharistic spirituality bridges the gap between frail human creatures and our loving Father/Mother/Creator. Paul wrote more than any other author of the New Testament but the only events of Christ’s life that he wrote about were that he died, he rose from the dead and he will come again. However, there is an exception: he wrote about the institution of the Eucharist, but it is in the Eucharist that we keep alive the collective memory of these wonderful events. The emphasis on remembering the death and resurrection continues in the next part of the Eucharistic prayer which is technically called the ‘anamnesis’ (its opposite is amnesia). All the Eucharistic prayers at this point say the Mass is a memorial of the death and resurrection of Jesus and sometimes they include the ascension. This remembering is not just a thinking back to an event of two thousand years ago. The Eucharist brings that event into the present moment. The Eucharist has something of the time machine element to it. We can think of the death and resurrection being brought to us in the time machine or the time machine taking us back to Calvary and the tomb. This is one of the great mysteries of the Eucharist: the collapse of time. The death and resurrection of Jesus are as real to us as if we were actually present when Jesus died and when he was raised into a new life. This is a very important part of the spirituality of the Eucharist. It helps us to think about our own dying to self-centredness and rising into a new life more centred on others as Jesus did. To celebrate the Eucharist in any meaningful way we must be attuned to this aspect of the mystery. We then offer to the Father the body and blood of Jesus. Usually the prayer also uses the word ‘sacrifice’ at this time. This word comes from the Latin ‘sacrum facere’, which means to make sacred. We have taken ordinary bread and wine and by the power of the Holy Spirit whose help we invoked earlier (remember the epiclesis?) they have become more than just bread and wine. They have taken on a presence of the risen Christ, and we now offer them to the Father just as Jesus offered himself to the Father during his lifetime. Look with favour on the oblation of your Church, in which we show forth the paschal Sacrifice of Christ that has been handed on to us. This offering continues the identification of the Eucharist with the death and resurrection of Jesus and inspires us to apply this theme to our own lives. A genuine spirituality must encourage us to die to self and live for others. Grant that all the faithful of the Church, looking into the signs of the times by the light of faith, may constantly devote themselves to the service of the Gospel. Without giving away what is essential, we must be open to changing our practices as the world around us changes so rapidly. Without appropriate change, the Church is at risk of being irrelevant to the lives of many people. Remember … all those who seek you with a sincere heart. The Eucharist embraces all people in its loving arms. Look, O Lord, upon the Sacrifice which you yourself have provided for your Church, and grant in your loving kindness to all who partake of this one Bread and one Chalice that, gathered into one body by the Holy Spirit they may truly become a living sacrifice in Christ to the praise of your glory.
. . . by the power of the Holy Spirit, as they partake of this one Bread and this one Chalice, they may be gathered into one Body in Christ, who heals every division. Remember our brothers and sisters [names may be added], who have fallen asleep in the peace of your Christ, and all the dead, whose faith you alone have known. Admit them to rejoice in the light of your face, and in the resurrection give them the fullness of life. Finally we pray for ourselves. The prayers focus on asking God to ensure we become members of the community of the saints and the angels in the next world praising God in his glory. Most of the prayers name Mary as one whose company we would particularly like to share. This central prayer of the Eucharist comes to a grand conclusion praising Father, Son and Holy Spirit It is called the ‘doxology’, and it is fitting that this prayer concludes with praise of the Trinity, the ultimate goal of our worship. As the priest recites this prayer he holds up high the bread and the wine. The gesture is very important. When a sportsperson wins they frequently lift their arms up; this seems to be a natural reaction to the jubilation of the moment. We see it happen on tennis courts and football fields; team barrackers do the same. Politicians and their supporters lift up their hands when their victory at the ballot box is proclaimed, often with hands joined to another’s. At the Eucharist the lifting up of the bread and wine may be seen as a symbol of the victory of Christ over sin and death and a spiritualisation of our gifts, an ascent to the Father. It is a moment of jubilation and it is very appropriate for the presider to sing it and the people to sing the ‘Amen’ with enthusiasm. A cardinal (sorry I can’t remember who it was) has boldly suggested that anyone who can truthfully say ‘Amen’ to the Eucharistic Prayer may receive communion! The Eucharistic Prayer is the living and pulsing heart of the Mass. The challenge is to listen attentively and respond enthusiastically not just with our minds but with our hearts so that we are participating ‘fully, consciously and actively’.